We all enjoy celebrating special moments* and many of our guests make a special trip to the Beach Villa Resort in Ko Olina, Oahu, Hawaii to do just that. Weddings, Anniversaries, College Graduations, Family Reunions, it's an honor to be able to share our little slice of paradise with you. If your special occasion is in need of balloons, cards, wrapping paper, tape, gift bags and other party supplies, head over to Party City in Waikele. They are nearby our property, the Beach Villa Resort in Ko Olina. 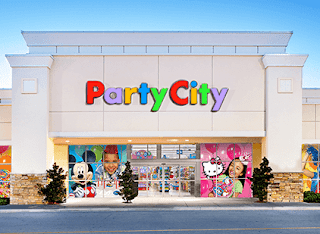 Party City carries an assortment of cards, gift wrap, helium balloons, luau supplies, tableware, drinkware, serveware, beach flip flops and other party goods. Sufficed to say, if you having a party, this is the place to go. Head out of the Beach Villa's Resort on the H1 freeway heading East ("Mauka or towards the mountain"), next take the 7 exit towards Waikele. ("Mauka, again towards the mountain") This should only be about a ten minute drive from the time you exit the Ko Olina resort until you arrive at the Waikele Outlet Mall. So come celebrate with us, and we'll bump into you at Party City, the next time your getting ready to celebrate your special moment. It would be our pleasure. *Our guests have celebrated the joining of two families through weddings, couples have celebrated their wedding anniversaries with three generations of families, families have celebrated graduations, birthdays and other milestones in their lives at our place. You name it and it has been celebrated here at the Beach Villa Resort in Ko Olina. Isn't it time to celebrate your story in paradise?